The Internet has now become the leading source for generating new clients for your business. This is true in every industry, including law firms. A majority of all people are now researching information on the Internet before ever contacting a company or purchasing a product. The convenience and the ability to research something without feeling pressured to purchase or use is the driving force behind this change in how people interact with businesses. Online marketing is a very specific type of marketing. There is no one-size-fits-all type of method to reaching potential clients. Every profession has types of marketing that works better on the Internet for their industry. 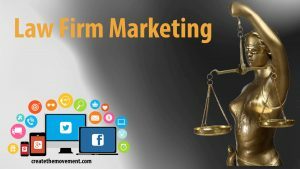 Law firm marketing is one of those industries where you must be very specific on how you market your services. Too broad of marketing strategies will not draw in the clients you need in your area. The wrong type of marketing can also prevent you from reaching your target base. To avoid these types of mistakes, legal websites are encouraged to use the following steps when marketing their firms. The most important thing that law firms can do is to make sure that their website is mobile friendly. Over 80 percent of all Internet searches are now done through a mobile device. So while you are doing internet marketing for law firm, Your site needs to be able to function properly on a mobile site or your clients will move on to a site that will work with their device. Never assume that your site is mobile friendly, even if it is a newer site. You need to make sure that it is set up for mobile viewing with your site manager or marketing firm. SEO, search engine optimization, is what helps a website be found on the Internet. When a phrase or word is put into a search engine, the search engine will pull up results that match this keyword. Search engines will provide preference to websites that show that they are in the near location to the person conducting the search. It is only logical to do it this way with the large number of websites hosted on the Internet. Answering questions for potential clients is one of the best ways that a lawyer can secure their business. People who are seeking legal assistance have a lot of questions. They are facing uncertainty in their lives because of this legal issue, and every bit of knowledge they gain about the issue makes them feel more secure. Be the “go-to” website for answering basic legal questions. Create a library of FAQ’s and give reasonable and easy to understand questions. Always put into your answers that an attorney can better assist you with this and any other legal questions you may have, and you will create a loyal following. Even if the visitor does not need your services now, they will feel a bond with your firm and return when they do need legal representation. Your clients are going to look you up on social media to see what your company is all about. Having a social media presence is essential so that people can feel connected to your firm. You do not want to use social media to just promote your service. You will need to use this venue as a way to make your firm more user-friendly. Make posts about local events your firm participated in or sponsored, comment on achievements by staff members, and talk about local issues that are non-political. Of course, post things about the law and do some self-promoting in this forum, but the main focus is to connect with the public. Make sure that your firm is registered with Google+ local. This will allow your firm to be mapped by Google and when anyone does a search for that area or for a firm in that area, your firm will appear automatically in the listing. Since Google mapping is one of the top services used by consumers, this is a marketing tool you simply cannot do without. It is one of the strategies for internet marketing for law firms. Consumers go to the Internet for information. They will research legal issues to self-determine if they have a case or need an attorney. Many of these consumers will use sites like findlaw.com or nolo.com. Make sure that you have an association with these sites so that your firm can be recommended when the site asks the visitor if they would like to connect with an attorney about their questions. This is a very valuable resource for attorneys and helps get very specific visitors to their site. There are many benefits to sponsoring local events, especially when it comes to marketing your firm on the Internet. The first and most important reason to sponsor local events is to build a relationship with your community. Banners and local advertising will feature your firm name and allow visitors to the event to see that your firm cares about the community. The second reason to sponsor local events is so that you can use this information to promote your firm online. Make sure that you post on your social media sites that the event is taking place and that your firm is a proud sponsor. Ask that the event place your link on their website promoting the event. Write a post about the benefits of the event on your site blog. It is all about connecting with the community. Following these seven steps to online marketing for your law firm will help you generate the type of visitors you desire that will easily convert into customers.